Air is introduced along one side of a rectangular tank to create a spiral flow pattern perpendicular to the flow through the tank. If the velocity is too great, grit will be carried out of the chamber; if it is too small, organic material will be removed with the grit. Air diffusers are located about 0.45 to 0.6m above the normal plane of the bottom. 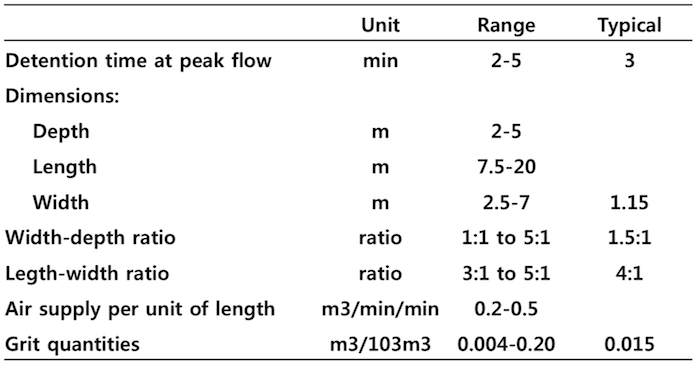 Assume a “tD” (3-4 min), determine the volume of the basin. The amount of grit produced is about 1.5 ft3/ML of wastewater flow. Add suitable depth from grit and free board.